TRUMPower is pleased to introduce the TMC150 series, which can generate up to 150W @ 7.5 CFM forced airflow and 100W @ convection. 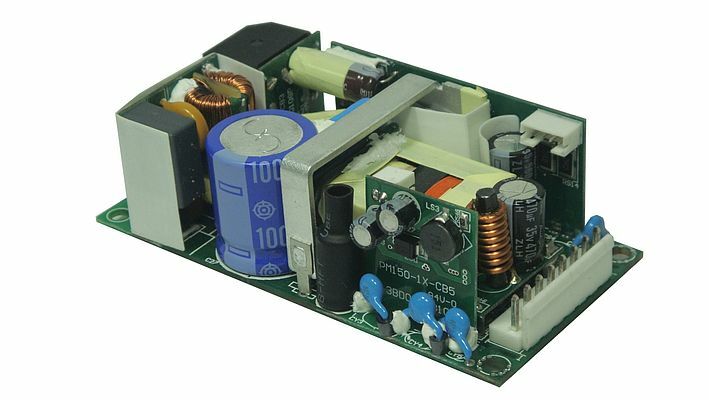 Packaged in a compact 2 x 4 x 1.2 inch open-frame form factor, the series is an addition to the 40W, 60W, and 100W 2" x 4" open frame power supplies that the company has had on the market. It can be used in various end-user applications. The TMC150 series is approved by UL, cUL and TUV to 3rd edition EN 60601-1, IEC 60601-1, ANSI/AAMI ES 60601-1:2005 and CAN/CSA-C22.2 No. 60601-1:08 medical standards and to 2nd edition IEC/EN/UL 60950-1 ITE standards. The unit has a universal input range of 90-264 VAC, along with 0.98 typical power factor with active PFC. The series meets 2 x MOPP and is designed for direct patient contact applications with its BF rated outputs. There are 7 standard models with output voltages 12V, 15V, 18V, 24V, 30V, 36V, 48V. The power supplies come with overvoltage and overcurrent protections. Withstand voltage is 4000 VAC from input to output, 1500 VAC from input to ground, 1500 VAC from output to ground. Earth leakage current is 105µA maximum @ 264 VAC, 63 Hz. The TMC150 series can be fully loaded at 0OC to +70OC ambient, with no derating required until +50OC and is suited for operating at up to 5,000 meters altitude. The series offers high reliability with MTBF of 250,000 hours minimum at full load at 25OC ambient, calculated per MIL-HDBK-217F. The power supply has remote sense and optional PFD. No load power consumption is <0.5W without PFD and <1W with PFD. The units comply with EN61000-3-2 class A & D, EN61000-4-2, EN61000-4-3, EN61000-4-5, EN61000-4-11, in addition to EN55011, EN55022, FCC/VCC class B conducted and class A radiated EMC standards. It achieves an efficiency of 87-89% and is compliant with RoHS requirements. For more detailed specifications of this series, please visit http://www.trumpower.com/library/tmc150.pdf or email sales@trumpower.com.